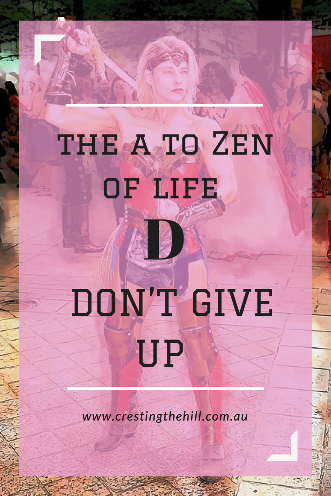 The fourth letter of my A to Zen of Life (via the Dalai Lama) is D for Don’t give up and Don’t give in. I confess to being a bit of a quitter at times and this one is a bit of a kick in the pants for me. When our son was a child (he’s a grown man now), he showed tendencies that led us to believe (rightly) that one day he’d grow up to be an engineer. He had excellent manual dexterity and was also quite creative…..but….if something didn’t turn out the way he wanted it to, he’d walk away and give up. He’d be part way through an art project and screw it up and throw it in the bin because it didn’t look quite the way he wanted it to. He always needed to be good at what he was doing and to get it right – preferably to get it perfectly right. We spent a lot of time teaching him that it was okay to have attempted something without it having a perfect outcome on the first try. Unfortunately I think he inherited the perfectionist gene from me. I always want things to go right the first time. I hate failing and I hate to look inept. But life doesn’t make it easy for us all the time, we learn by failing and trying again. We develop strength of body and character by re-doing and improving. If we give up at the first hurdle, then we never discover who or what we are capable of becoming. Perfectionism can stand in the way of becoming our best selves, it makes us believe that it’s not worth it when we fail – why not just give up and move on? “If at first you don’t succeed – try, try again” is a famous quote for a reason. I am learning that you can get better with practice, and also that you can enjoy something without it being perfect. If I give up too soon then I miss out on working through the tough bits to find the reward at the end. Today’s world makes us feel like everyone else has it figured out and they are all living wonderfully easy lives. That’s the highlight reel – most of the time we all struggle and push through, ultimately that’s what gives us those highlight moments that we all rush to share on our social media! It's the hard slog and not giving in that makes those moments so special. Are you a perserverer? Or do you quit at the first hurdle? Let me encourage you to try, try again – who knows what you are capable of achieving if you don’t give up! Valuable wisdom in this post Leanne. I also have perfectionist tendencies and sometimes lament that there doesn't seem to be anything at which I'm "excellent" but I've learned to be more kind to myself as I've gotten older. This blogging challenge, though, has shown me that I'm a bit like Santa Claus - "making a post and checking it twice - or three times, or four, or more........"!!! 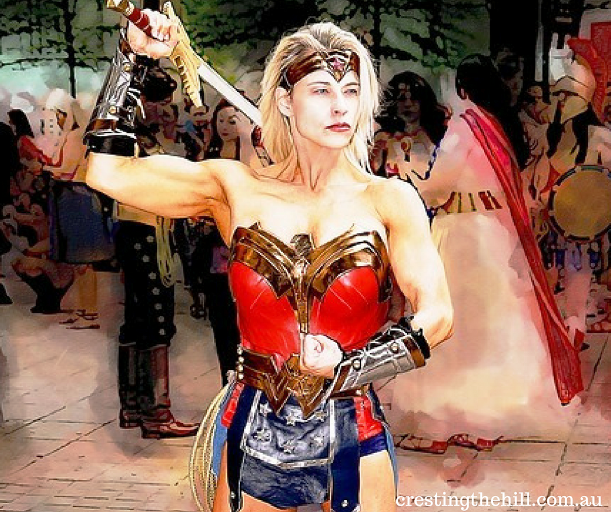 Hi Leanne, Another excellent post and I LOVE the image you've used. So strong and confident. I'm definitely on the persistent side of things, some might even say tenacious - which can be a good thing, or a bad one when tenacity is simply a determination to get things exactly right. Did your son learn to honour his attempts or is he still a perfectionist? I've always wondered if self-acceptance can be taught if caught early. Great post. I am guilty of giving up , but not always. Hi, Leanne - I completely agree that today's world (especially Social Media) can makes us feel that everyone else has it all figured out. Your post is an excellent reminder that NONE of us are perfect, nor were we meant to be! Oh yes, I'm a perseverer. I'm also a perfectionist, so how can I give up before it's perfect? (And just the other day I asked my brother if he thought I might be a little OCD - He cracked himself up! "A LITTLE OCD?" So how's that? An OCD Perfectionist Persever? Dopamine: Do you Drip or Do you Drown? yes thanks for that pep talk ; I can be a quitter and I can be determined. the other night in bed I went - whaaatttt blog every day I must not be well I better walk away now . and then in the morning the world was rosy again. of course there are times when quitting is the perfect thing to do - going against the grain - it is having that capacity to know when to forge ahead and when to surrender .. It isn't easy to keep trying and failing but, as you so wisely said, its in the failing that we learn. Why not put that learning to use and try again. Good reminder. Oooh...I have that perfectionist tendency, but also a stubborn streak. So I don't always give up easily, the problem is walking away when I should. How lovely to find another Aussie A-Zer. Like you I am a perfectionist, but luckily I also persevere (although sometimes that isn't a good combination). I don't know if I so much give up for a lack of perfection or just a loss of interest. I have a terrible focus problem where I always just have too many things going on at once, and as time goes on things are left incomplete or never even started for all the other projects I am running between. Leanne, My fear of being seen as inept means I procrastinate starting something or plan it to death before starting. Once in though, I push to completion. It's hard for me to admit I made a wrong decision on starting/committing to something. Even when I should. This has been a hard trait to have in retirement when all the things I was good at (working) are gone. Learning to be OK with being a beginner and OK with not continuing it if it's not working out (just "trying it on")... that's very different than a don't give up mindset! And approaches I have hard to learn (am still learning). This is something I'm not too bad at, for a change! I'm not much of a quitter, but my daughter is, though for different reasons than your son. She jumps into things with both feet and then loses interest somewhere in the middle. It's a struggle. I never give up! I just keep on till I'm as near perfect as dammit. *maybe I have low standards* Lol! Liz http://www.poetryroundabout.com I'm doing Z to A so today is W.
I love this, Leanne so thank you for sharing it! I'm not a quitter and I can't stand those who are. I mean, a quitter after the first try. No, if you try a dozen times and still haven't managed to master whatever it is, by all means, improvise and move on. :) I like to push myself to the limit so giving up just isn't in my nature. I have a daughter who is going to go to college to be a biomedical engineer. She was, and is, also a perfectionist. Thankfully she is beginning to see life as a set of experiments. From those that "fail," she can still learn things. I think that's a good lesson for all of us. Great post! This is one I need to print out and paste on my forehead. This is such a great theme for the A to Z Challenge. I'm enjoying what you are writing about each day. I am so bad at this. I'm a perfectionist too and if I'm not great at something first time then I'm really tempted to just give up. This is a great reminder to keep going and stop worrying about being perfect. After all, the only way we grow is to keep failing and trying again. I tend to be quite tenacious - as long as I'm not distracted by something shiny & new. It's why, I think, that I write my first drafts relatively quickly - before I can get bored! I drive my girls crazy because I'm always lecturing them on the importance of grit. 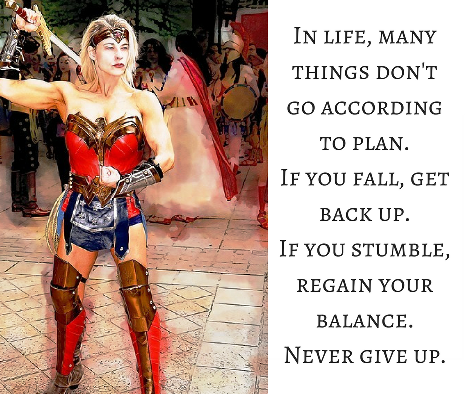 You have to stick to things even though there are often setbacks along the way but having grit helps to push you through to the finish not that I always take my own advice. I also learned to temper my perfectionism long ago. I kept telling myself done is better than perfect. I still strive to do things as close to "perfect" as possible but at some point you have to let it go and finish. I persevere but I also procrastinate. Early in life I learned to expect far less than perfection. But I wanted to be perfect so maybe someone would notice. It took decades to get over this. But I am am tenacious and I persevere, but just toward getting things done in a pretty good fashion. Finished is better than Perfect. Learned this in an extremely difficult quilting class. It was a good lesson and one I remind myself about when I get overly picky. With good skills and reasonable expectations almost any level of perfection can be achieved. Just keep jumping the hurdles...one at a time. I stick with something to the bitter end, AND I’m all perfectionistic about it. Really, it’s a miracle that I managed to talk myself into retiring! I like this post! I am all for not giving up, if I had given up with my illness then where would I be now?